Cherry Orchard Farm01600 888152work Shop - FarmThe farm is situated in the beautiful Wye Valley between Monmouth and Chepstow and has been a family run business for over thirty years. The farm extends to just over ninety acres and is all permanent pasture. 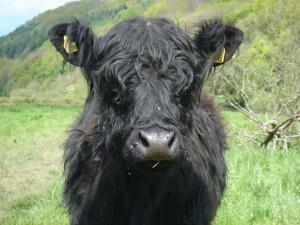 The farm herd consists of our small herd of pedigree Galloway cattle and our main herd of Hereford x Friesian cows. The Galloway is one of the oldest and purest of our native cattle breeds. The females are maternal, hardy and produce an excellent beefy calf, which is in great demand by people wanting highest quality, natural grown beef. We have recently found that by using our pedigree Hereford bull on the Galloways produces meat of a more superior quality. It has the flavour of Galloway with the succulence of Hereford. Both breeds are recognised as traditional breeds. The Galloway is a traditional breed and this system suits them well, allowing the beef to mature slowly and adding to its taste and flavour. We believe that meat from animals fed on a natural diet will be as tender as it is richly aromatic and savoury. We know that the health of our animals benefits from a life enjoyed outdoors in clean air. Stress is also kept to an absolute minimum, with no-over crowding and a short journey to our local abattoir. The farm is situated in the beautiful Wye Valley between Monmouth and Chepstow and has been a family run business for over thirty years. The farm extends to just over ninety acres and is all permanent pasture. We perceive you, our customers, as a community of like minded people who enthusiastically share an enjoyment of the very best, seasonal food produced on the farm and delivered directly to your door.